A romp through the Central Highlands, the Truong Son Dong Road is a ride to be savoured, both for scenery and for sheer riding pleasure. 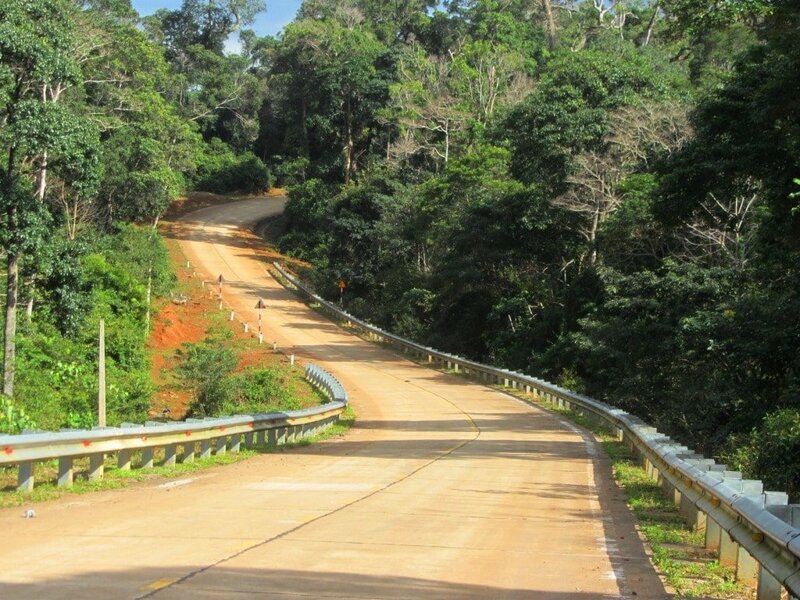 Many sections are brand new: in excellent condition as they pass through dense jungle, cutting dangerous passes along steep ravines, meandering, like a river of asphalt, through rolling farmland. And yet, traffic is light and the land sparsely populated, with minority towns with strange and exotic sounding names, like Ayun Pa, K’Bang, and Ea Ly. 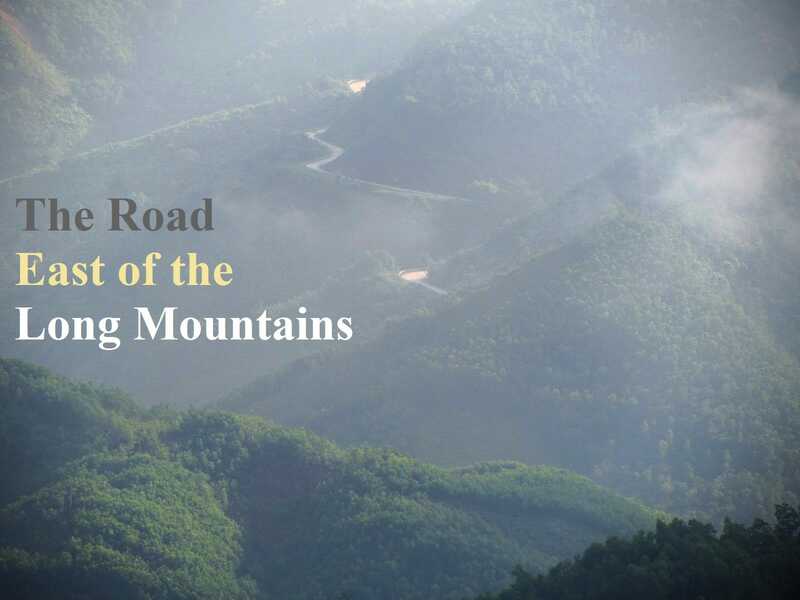 The name of the road in Vietnamese, Đường Trường Sơn Đông, has romantic connotations: literally ‘Road to the East of the Long Mountains’. Historical, poetic, and mystical overtones run throughout this journey: the Central Highlands has long been a place of spirits and ghosts, of myths and fairy tales, of unknown peoples and wild animals, and of war. The geographical ‘abdomen’ of the nation, control of the Central Highlands has always been strategically important: to the Vietnamese, the French, the Americans. As such, there’s a military undercurrent to this route which, at times, feels like a highway built to aid guerrilla warfare. This is my guide to The Road East of the Long Mountains. I’ve written this guide in 5 sections, all of which are relatively short and can be comfortably completed in a day. The main purpose of this guide is to ride the length of the Truong Son Dong Road. Although the southern and northern parts are still under construction, the central section (which this guide focuses on) is in pristine condition. It’s possible to join the Truong Son Dong Road at several points along its length (see the red east-west lines on my map), but I’ve chosen to write this guide starting from Dalat, because this is where the road will eventually reach, and it seems fitting to begin this crawl through the Central Highlands from the hub for travel in the region. 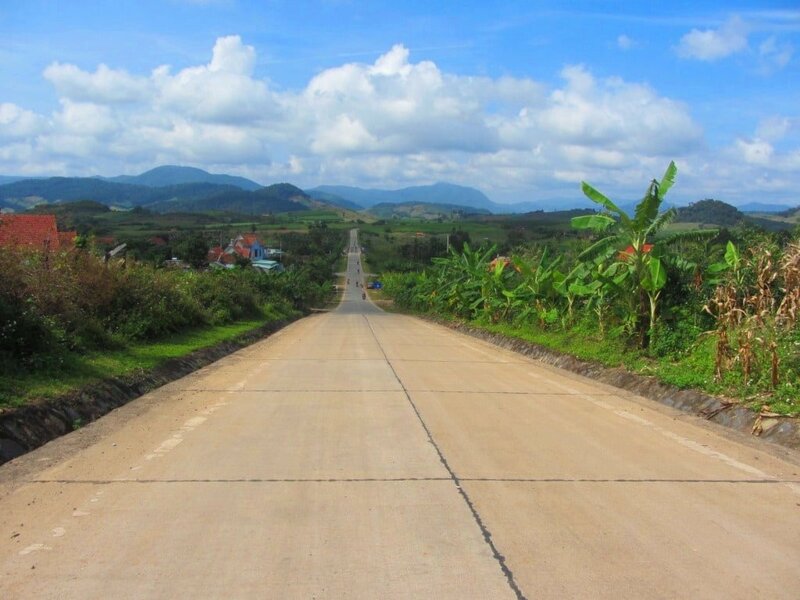 When it’s finished, the Truong Son Dong Road will link up with the Pine Tree Road (just north of Dalat) and run all the way north to Thanh My (60km west of Danang) on the Ho Chi Minh Road. Currently, the Truong Son Dong Road is complete from M’Drak to Son Tay, all of which is covered in this guide. There are also some fully complete sections of the road which do not yet link up with the rest of the route: I’ve marked some of these short but impressive stretches in red on my map, but at present they are dead ends. Although parts of this route are quite remote and see very little traffic, there are gas stations and villages at fairly regular intervals, and in my guide I’ve included suggestions of places to stay and eat along the way. The best time of year is spring or summer (March-July), but weather is always unpredictable in this mountainous region, so be prepared for sun, rain, cold, and heat. Head west out of Dalat on Cam Ly Street, leaving the greenhouses, tourists, and increasingly heavy traffic of this mountain city behind. Hang a left (due southwest) on the road down the mountain to Ta Nung Village. Recently upgraded, this mountain pass zigzags through pine trees and mist to a heavily cultivated valley. Continue south through Ta Nung, perhaps stopping for a look at the impressive Elephant Falls and snapping a few photos of the coffee plantations (although there are plenty more of those to come on this road trip), all the way down to the intersection with Route QL27. Bear right (due northwest) onto QL27 and follow it through a featureless, farmed valley, until the road begins to climb. Two consecutive passes (the first quite slow and bumpy; the second very smooth and great for riding) take you around the western edge of the Lang Bian Plateau. It’s quite a scenic ride, with jungled mountains broken by coffee, banana and corn plantations. This is coffee country, and, depending on which season it is, the cool mountain air is either heavy with the nutty, earthy aroma of the coffee bean, or the sweet, flowery fragrance of the coffee blossom. Vietnam is currently the second largest producer of coffee in the world: cultivation of the bean is on a massive scale in this region. It provides an income to millions of Vietnamese, but it also comes at huge cost to the forests. Much of the landscape you see on Route QL27 was primary forest not long ago, but now, in some areas, there’s barely a tree left standing for all the hundreds of thousands of coffee bushes that have been planted. It’s a plundered but productive landscape as you ride northwards on QL27: up and down more mountains passes, over valleys flooded for hydroelectricity projects, past minority hamlets of wooden longhouses choked by smoke from the hearths, on an excellent, meandering, tarmac road all the way to Lake Lak. A natural lake in a wide valley ringed by mountains, Hồ lắk (Lake Lak) has long been touted as a tourist attraction. It’s a very pretty place with a friendly little town (called Lien Son), a large ethnic minority population, and several accommodation options. But, although there’s something magical about the silence here and the pink sunsets over the placid waters, Lake Lak has yet to grow into a destination in its own right. Rather, it’s perfect for a stop on a road trip to somewhere else, as in this case. Stop early in the afternoon so as to have time to soak up the atmosphere here and choose from several accommodation options: Try the clean, simple and friendly Moi Truong Hotel (40 Au Co Street; 200,000vnd), or one of several roadside nhà nghỉ (local guest houses), such as Nha Nghi Ho Lak (201 Nguyen Tat Thanh Street; 200,000vnd), or get a lakeside cabin at Lak Resort ($25), or splash out on the new, very atmospheric, lake-view wood-and-canvas longhouses at Lak Tented Camp ($90). Good street food, including noodle soups and bánh xèo (Vietnamese savoury pancakes) can be found on the high street near the local market in the mornings and evenings. 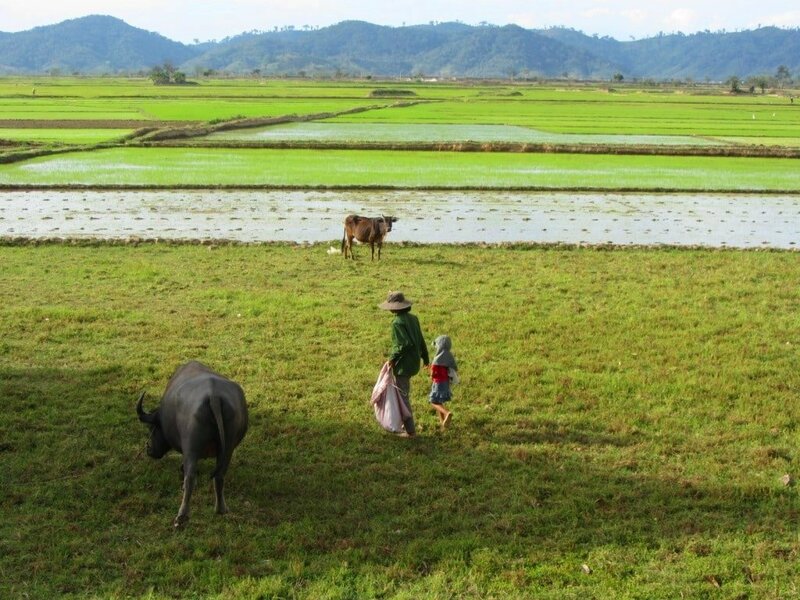 Continue north from Lake Lak on Route QL27, passed shimmering rice paddies, grazing cattle and a backdrop of mountains, to the junction with Road TL12. Now, it’s decision time: from here there are two options to get to M’Drak, both of which are 130km. Option 1 is slower because of some rough road conditions, but more scenic; Option 2 is quicker because it uses highways, but less interesting. OPTION 1: (Marked in grey on my map.) If the weather is good and you have some time to spare, turn right (due east) on Road TL12 and follow it all the way around until it hits Highway QL26. Turn left (due north) onto QL26 and head up to M’Drak. This route leads around the northern edge of Chu Yang Sin National Park, including some good scenery from Cu Dram (about midway on TL12) until Highway QL26. But Road TL12 is only in OK condition: the second half is the worst, and if it’s been raining it can be very slow going. However, if weather conditions are good, the potholes and scarred road surface will still slow you down but won’t spoil your enjoyment. If you run out of time, there are a couple of local guest houses (nhà nghỉ) at Cu Dram. Once you meet Highway QL26, it’s a smooth, fun, meandering ride up swirling passes to M’Drak. It’s interesting to note that, just south on Cu Dram on Road TL12, is a small village called Yang Mao, where there’s an isolated and beautiful section on the Truong Son Dong Road. For several kilometres south of Yang Mao this brand new road (see the red line on my map) weaves along a pretty and remote valley, until it ends at a construction site, where they are continuing to carve the road into the mountains. 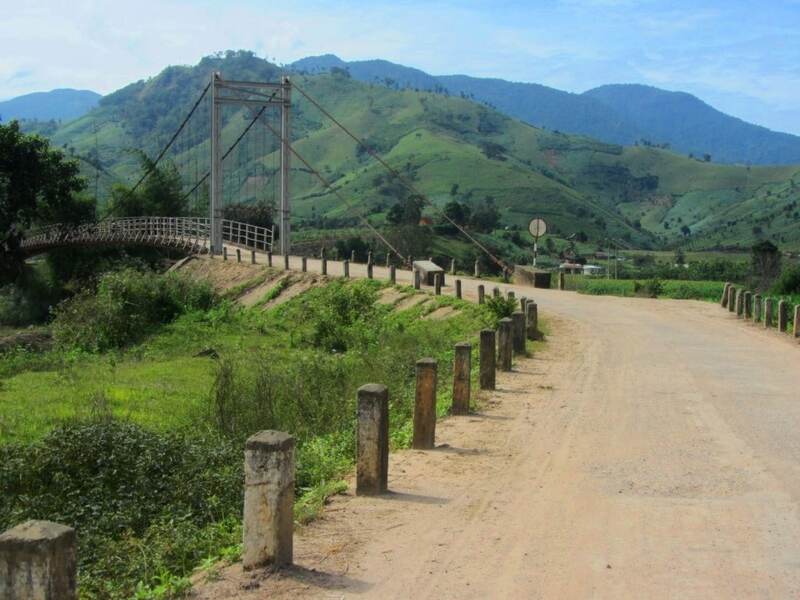 When it’s finished, this road will go over the mountains and meet the Pine Tree Road and then on to Dalat, thus completing the southern extent of the Truong Son Dong Road. But, for now, it’s a dead end. M’Drak has a couple of decent guest houses, including Yen Nhi (0984 351 578) with simple but clean rooms for around 200,000vnd and a friendly owner (Nha Nghi Yen Nhi is signposted off the main road opposite the large Honda garage, down an alley). There are plenty of food and drink options on the highway as it passes through town (don’t forget to try the excellent local coffee). Just south of M’Drak there’s another dead-end section of the Truong Son Dong Road (see the red line on my map). It’s in perfect condition, including a surreal stretch where it widens into a airstrip before coming to an abrupt stop, ending in a muddy lane. This will eventually continue south to Yang Mao (near Cu Dram) where it will meet the section of road that is already completed over there (as mentioned in Option 1). But it will be a long time before this is completed. Note: M’Drak, on Highway QL26, is where you will join this route if you are starting from Nha Trang (see the east-west red line on my map). Just north of M’Drak turn right (due northeast) onto an new but unmarked road which quickly joins up with Road DT693 (also marked as QL19C). After a couple of minutes, bear left (due north) at Ea Lai fork. This incongruous turning is the beginning of the central section of the Truong Son Dong Road. From this point on it will lead you across plateaus, over mountains, and through jungles for nearly 400km, and most of it will be deserted: a whole new road through the middle of the Central Highlands almost all to yourself. In its current state it’s about 70% complete: from M’Drak to beyond Son Tay. 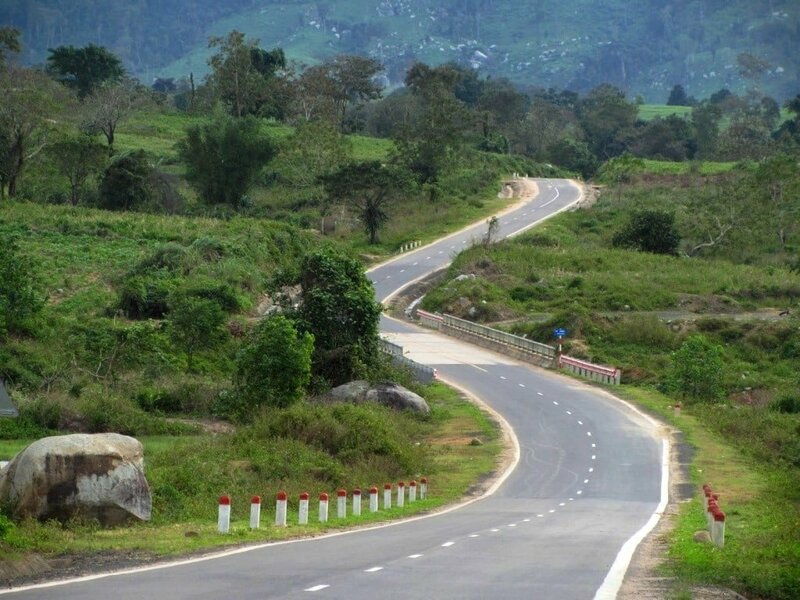 But, when it’s finished, it will lead from Dalat all the way to Thanh My, on the Ho Chi Minh Road. Bits of it are not yet marked on any maps, including Google Maps (although I’m sure this will change very soon). This is the case with the middle of the first section, from the Ea Lai fork north to the junction with Route QL29. I’ve drawn the route as I best I can on my map (see the red line), so it should be pretty easy to follow. Parts of the first first section of the Truong Son Dong Road, from Ea Lai to QL29, are made of large concrete slabs (much like the Western Ho Chi Minh Road), but other parts are smooth tarmac. It’s a rolling route up and down steep slopes covered in coffee, sugar cane, eucalyptus and rubber plantations. 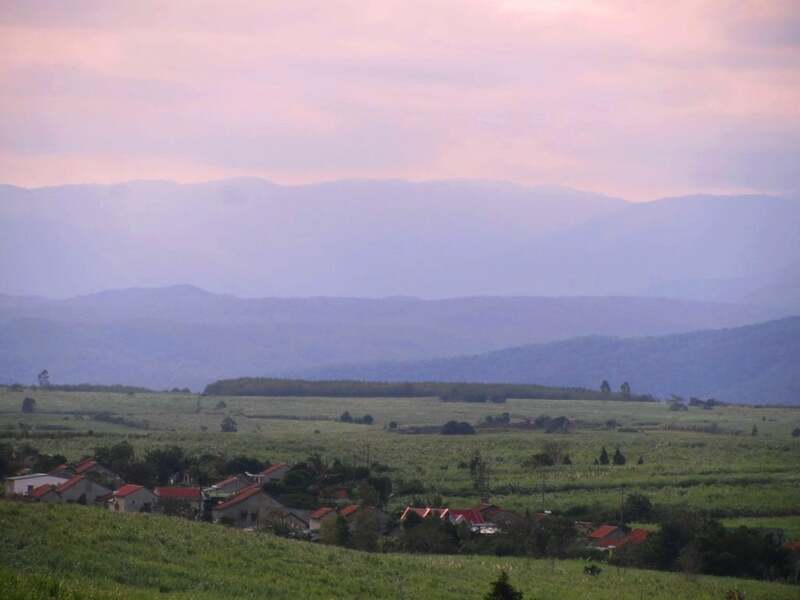 The riding is excellent and the scenery is very pretty as the road ploughs through Ea So Nature Reserve, with large stands of jungle and mountain rivers – great for a dip if the weather’s warm. Even in bad weather, it’s a thrilling stretch of road. Note: despite Google Maps showing the route of the Truong Son Dong Road from M’Drak to QL29 running due west, parallel to the course of the road I’ve marked on my map, in reality there was no evidence of this at all. I was constantly reassured by locals that the road I was riding on – the one marked on my map – was, indeed, the Truong Son Dong. I made two separate passes over two weeks to make sure of this, and, at the very least, can guarantee that the road marked on my map exists, is in good condition, and passes good scenery. Turn right (due east) at the junction with Highway QL29 and follow the latter for a few minutes to Ea Ly village. Turn left (due north) onto a road that’s all but a white line on Google Maps, but in reality it’s the continuation of the Truong Son Dong Road. 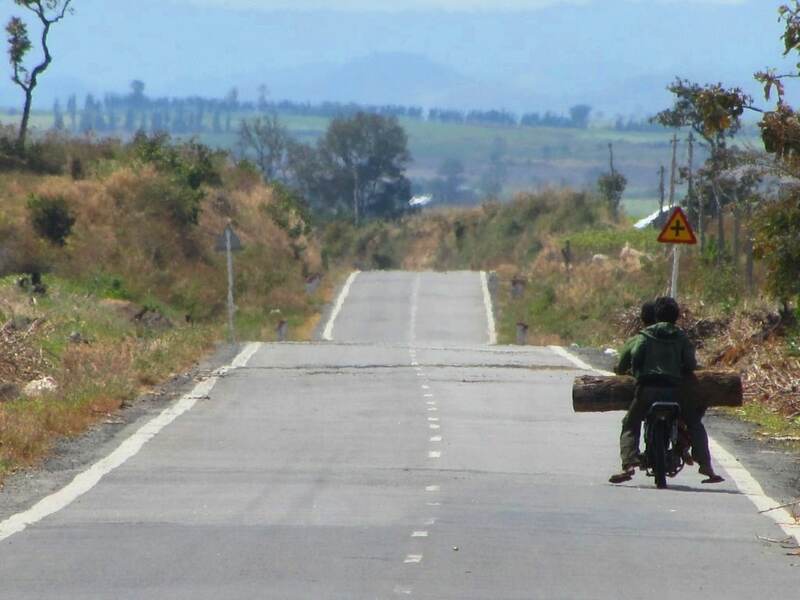 Switching from freshly laid asphalt to large concrete slabs, the road blazes up hillsides, across farmland, over rivers and lakes until it hits Route QL25 at the Cau Le Bac junction. Mango, cashew, and cassava plantations decorate a flat basin, surrounded on all sides by forested mountains. There’s hardly any traffic: goats, cattle, pigs, and chickens own the roads here. Minority villages, consisting of wooden plank homes raised on stilts a metre above the dirt, are scattered across the landscape. Many of the women and girls wear their colourful, highly decorative, traditional dress. Adults have handsome faces, big smiles, and their kids are playful when you stop by the road. But it looks like a rough, tough life here: the daily work is physically demanding and starts from a very early age: young girls carry wicker baskets full of wood on their backs, the same labour that has bent their grandparents double. At the Cau Le Bac intersection, turn left (due north) for a brief stint on Highway QL25 up to the exotic sounding town of Ayun Pa. It’s a good 25km ride, including a lush, wide pass, but even this short stretch can be blighted by trucks and dust: if anything this serves to remind you how lucky you are to be riding the empty tarmac of the Truong Son Dong Road. Ayun Pa makes a good lunch stop, and there’s a guest house (Nha Nghi Hoang Lan; 43a Tran Hung Dao; 059 3852 180) as the road enters town, if you need it. Otherwise, you can bypass the town altogether by bearing right before the high street along a fabulous dyke road above a sea of rice paddy. Note: the Cau Le Bac intersection on Highway QL25 is where you will join this route if you are starting from Tuy Hoa (see the east-west red line on my map). Ride out of Ayun Pa on Road DT622, heading north. After a bumpy and busy beginning, the road smooths out, and it’s an easy, unimpeded ride for 80km all the way to the intersection with Highway QL19 at the Dak Po crossroads. Characterized by an enormous agricultural plateau that the region is famous for, this is a relatively boring but quick ride across a patchwork quilt of large, windswept fields, past minority villages which either look grim and bleak in the grey highlands drizzle, or warm and attractive in the sharp light of a good highlands day. The road is arrow-straight as it crosses the wide, treeless plain, ringed by distant mountains: it feels like riding across a vast crater. A small pass leads over a forested ridge, after which the terrain is undulating, and the Truong Son Mountains – the jagged spine of Vietnam – rise tall and menacing, covered in cloud, to the north and west. If you’re short on time, turn right at the crossroads onto QL19, where there’s a guest house (Nha Nghi Thuy Chung; 0168 9013 435) on the left side of the road after a couple kilometres, in Dak Po. But, if time is no concern, it’s best to continue straight over the crossroads, heading north towards K’Bang. This is a pleasant and easy stretch of road through a rolling, rural landscape dotted with red-tile-roofed farmhouses. The lower slopes are cultivated with banana, sugar cane, eucalyptus and cassava, but the higher ground is still cloaked in dark green jungle. It’s a peaceful, bright and warm valley. Traffic is light, the tarmac is freshly laid, and the riding is good as the road weaves across this agricultural landscape. Note: the Dak Po crossroads is where you will join this route if starting from Quy Nhon on Highway QL19 (see the east-west red line on my map). Buffalo wade through streams and bathe in muddy puddles, children play in the red dirt of dusty front yards or herd cattle, while their parents cook, clean, hoe and harvest the fields. This is a gentler version of the Central Highlands: not overly farmed or exploited on an industrial scale like some parts of the region are. 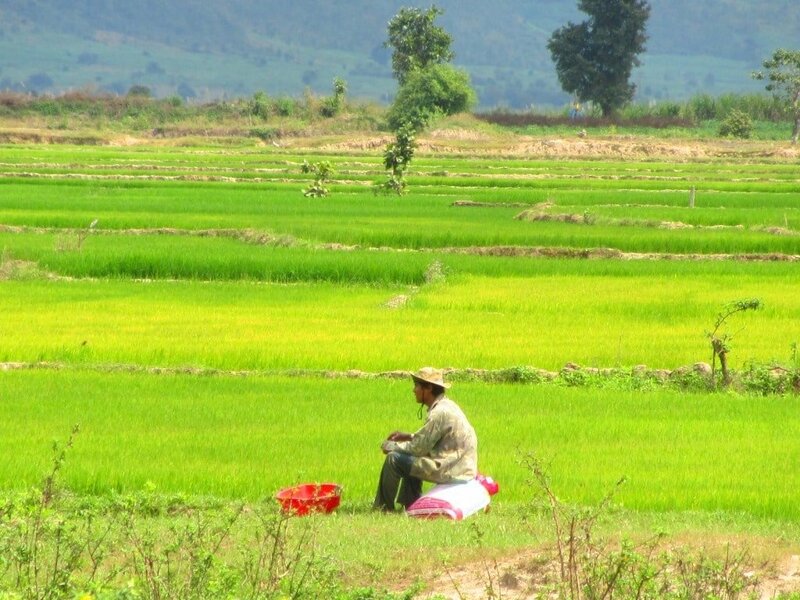 But, in a country like Vietnam, where almost any crop can be cultivated, and with a rapidly increasingly population and a growing economy, the pressure on land is huge, both for agriculture and for urbanization. 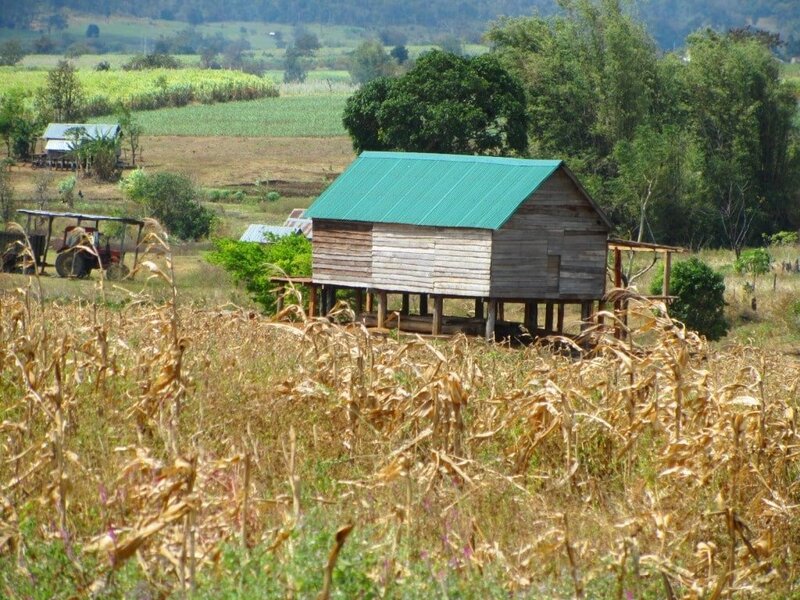 Land is precious and must be made the most of, which, for now, means farming and building. In a few years, the forests on the high ground here will surely be replaced by crop fields. After 25km the road drops into the likable town of K’Bang (which sounds like the onomatopoei used in comic books when a superhero punches a villain: K-Bang!). A friendly place with several decent guest houses and food joints along its main street (Quang Trung), K’Bang makes a good night stop. Try Nha Nghi Ly Kinh (468 Quang Trung Street; 0963 223 244; 150,000-200,000vnd) at the northern end of town, or Nha Nghi Xuan Hoa (235 Quang Trung Street; 0982 034 274; 200,000vnd) in the middle of town. If you’re not staying in K’Bang, continue straight on the road as it bypasses town and heads northwards, into the jungle. North of K’bang is where the wilderness begins. Not 10 minutes out of town, the Truong Son Dong Road (marked as DT669) turns into concrete slabs, like a giant pack of dominoes laid on their sides on a rolling path through thick jungle. The scruffy patchwork of highland farmland fades away, as towering tropical trees close in on the road. Coffee plantations threaten the forests here – an environmental hazard made worse by the easy access which this road affords – despite signs in the local ethnic minority dialect promoting the protection of the jungle canopy. Not long after leaving K’Bang, the road widens into a 6-lane, dead-straight, utterly deserted highway in the middle of the remote jungle. This is known as the ‘airstrip‘. Initially, I had assumed it was an old US air base, a relic of the ‘Vietnam War’. But locals tell me it’s new, just a few years old, constructed at the same time as the Truong Son Dong Road . It’s a surreal and strangely haunting sight. After the ‘airstrip’, all people and traffic disappear as the road plugs you deeper and deeper into a rich seam of highland forest. The riding is excellent: the road is in good condition with multiple switch-backs, long meandering stretches, and fast straights. 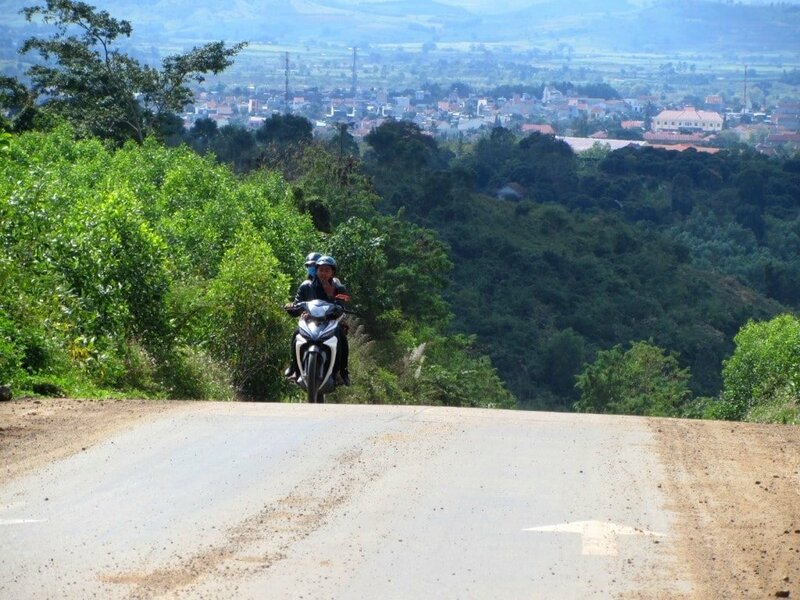 For pure riding sensation and pleasure, it’s on a par with the passes between Thanh My and Prao on the Ho Chi Minh Road. 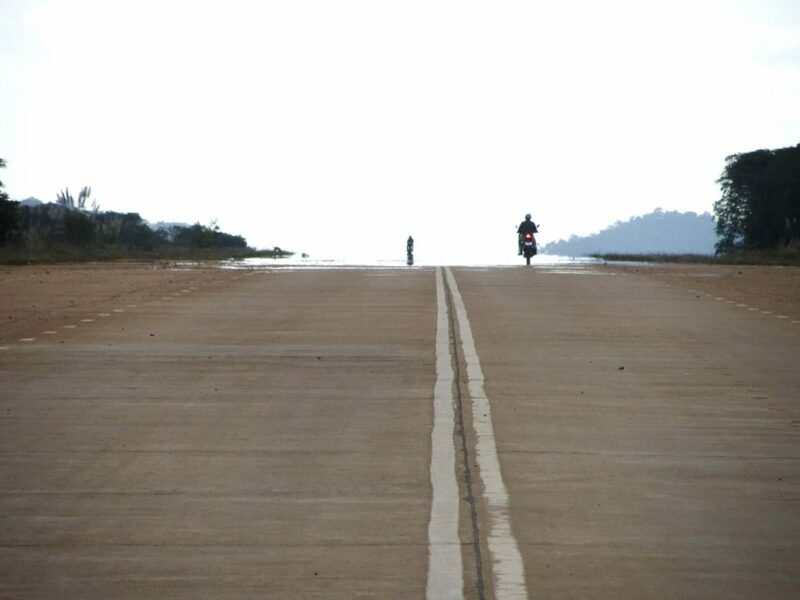 It’s as if a Moto GP race track had been laid in the middle of the Vietnamese jungle. Stop to wash in mountain streams and gaze over the endless canopy of trees – echoing to the strange sounds of unknown animals – and enjoy the peace and absolute quiet of this place. But remember to fill up with gas in K’Bang, because there’s precious little available on this stretch of road, or indeed, on the next. (If you really do get stuck for gas, some of the local wooden homes should be able to supply you with some: just ask for xăng). At the remote Xa Hieu crossroads with Road QL24 (also marked AH132), you could choose to turn left (due west) to Kon Tum and the Ho Chi Minh Road, or right (due east) to Ba To and Highway 1 on the coast. 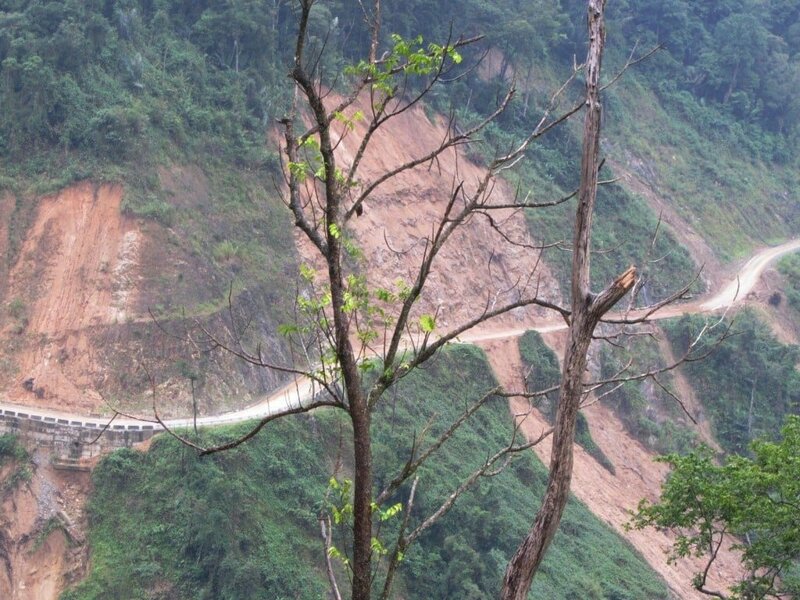 But the wildest and most scenic option is to continue straight on (due north), following the Truong Son Dong Road on a death-defying pass, crawling along a mountainside draped in dense jungle, high above a raging river. In bad weather, when visibility is sometimes less than a few feet, this can be a terrifying ride, with landslides, mudslides and rockfalls sending whole trees tumbling down the cliffside and, in some cases, sections of road plunging into the valley. But, in good weather, it’s an extremely beautiful section of mountain road through alpine scenery laced with pretty rivers and waterfalls. Either way, it’s important to ride carefully, and make sure you bring a jacket, because it can get chilly up on this pass. Waterfalls crash down the sides of mountains, roaring as they pass under the road. Next to one of the cascades a bold, proud sign reads Đường Trường Sơn Đông – The Road East of the Long Mountains: a monument to this (ongoing) feat of engineering. Slowly, the road helter-skelters down the mountainside and brushes the banks of a cold river. The peaks looming in the distance become higher as the road nears the foothills of Ngoc Linh, the highest mountain in all of central and southern Vietnam (2,598m). The air is cooler here and the valleys tighter, planted with cinnamon and eucalyptus trees. The town of Son Tay (Western Mountain) clings to the banks of a great river, tamed by a hydroelectric dam. A small, quiet place in a magical position, Son Tay is, for the time being, the end of the Truong Son Dong Road. It makes sense to stay here a night, after the long crawl through the mountains. There are a couple of nhà nghỉ (local guest houses): try Nhà Nghỉ Châu Phong Diễm Châu (091 412 0145; 200,000vnd), on the edge of town before crossing a small bridge over the river. Rooms are simple but clean and the family are hospitable. The high-street has several cơm phở (rice and noodle) places for meals: try to find one selling mì quảng, a delicious and much-loved noodle dish, famous in this area. Although the Truong Son Dong Road does continue north from Son Tay (marked as Road 623 – see the red line on my map), at the time of writing it was impassable due to ongoing construction and landslides. This section of road will eventually lead over the mountains to Kham Duc and Thanh My, where it will join up with the Ho Chi Minh Road. Currently, some short and scenic sections of this part of the Truong Son Dong Road are complete, but they do not yet link together. However, it’s well worth asking for the local opinion on the road north when you are in Son Tay, because the next section is bound to be a spectacular ride (and it would be a very neat link with the Ho Chi Minh Road continuing northwards). But, for the time being, in order to continue this road trip, head east out of Son Tay, on Road DT630, towards Son Ha (also known as Di Lang). This is another wonderful ride over mountains bursting with tropical foliage and fruits, and heart-melting views over valleys and villages tucked into the folds of misty hills. Son Ha (Mountain River) is a surprisingly large town and a very likable place. 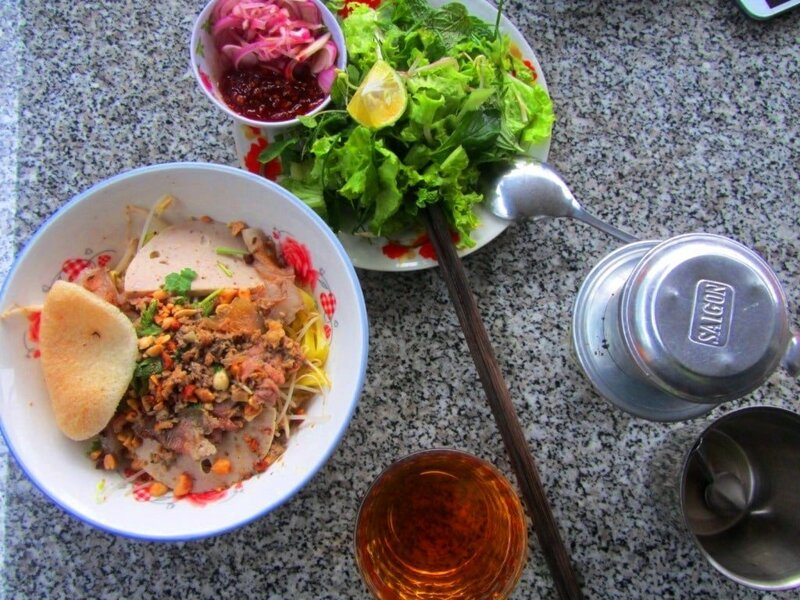 There are several guest houses (Nhà Nghỉ Duy Nghĩa is a good option; 0169 356 9176; 200,000vnd), lots of cafes (try the strong brew at Monaco Coffee), and plenty of informal places to eat. There’s an enticing mountain road north of Son Ha (Road DT626), but again I was informed that its current condition is bad. 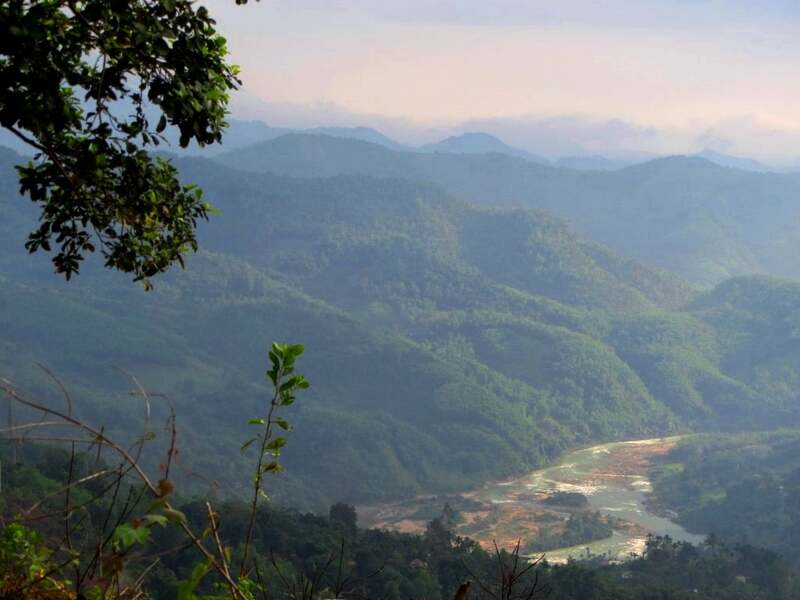 So continue east from Son Ha on Road QL24B, along the lush valley of the wide, fast-flowing Tra Khuc River. This road is fine but rather beaten, so watch out for potholes. Quang Ngai is a seldom visited city on Vietnam’s main artery, Highway 1. A medium sized city, its back-streets are tree-lined and its riverfront roads, along the Tra Khuc River, are a great place for a late afternoon stroll. There are lots of accommodation options: $25 gets you a river-view room and a large swimming pool at the My Tra Riverside Hotel, or $10-$15 will get you a decent, clean room at Dong Khanh Hotel. There are good food stalls along the waterfront on Ton Duc Thang Street, or look out for signs in town for cơm gà (chicken and rice) for which this province is famous: try it at Cơm Gà Nhung (136 Phan Dinh Phung Street). On the north bank of the river, an enormous new cafe and entertainment complex has recently opened. Coffee Ocean Blue is a fabulous place to watch the sun set over the river behind Ngoc Linh Mountain. On the opposite side of the street, the incongruous bar/club would be more at home on one of the Mediterranean ‘clubbing islands’. But it’s extremely well done and the only place in town to get a good cocktail and party all night (well, until around 11:30pm). 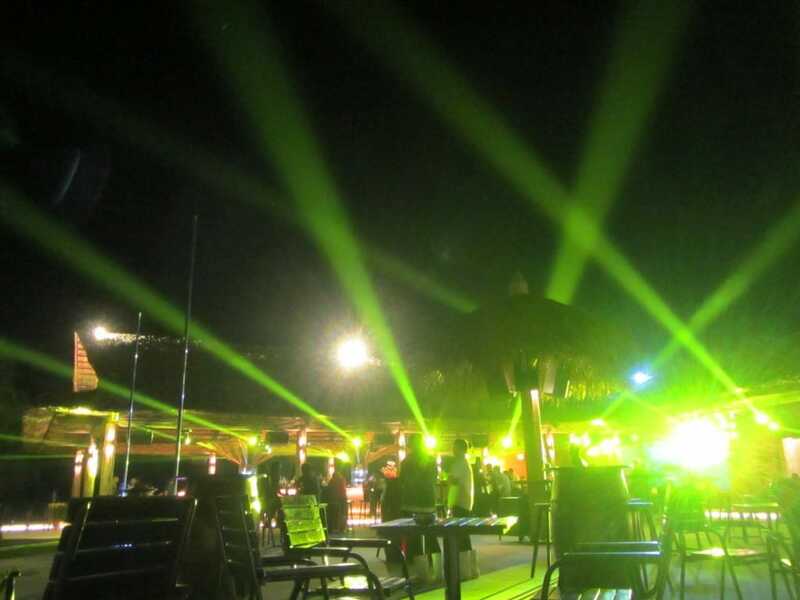 Think stone dance floor, bamboo bar, soft seating chill-out area, laser shows, live DJs and, erm, pole-dancing. A fun and slightly surreal night is guaranteed. From Quang Ngai there are several options for continuing your road trip. Heading North: continue along the coastal back roads to Hoi An and Danang (see the map in my Beach Bum route), or link up with the Ho Chi Minh Road at either Kon Tum (connecting via Road QL24) or Kham Duc (connecting via Road QL14E). 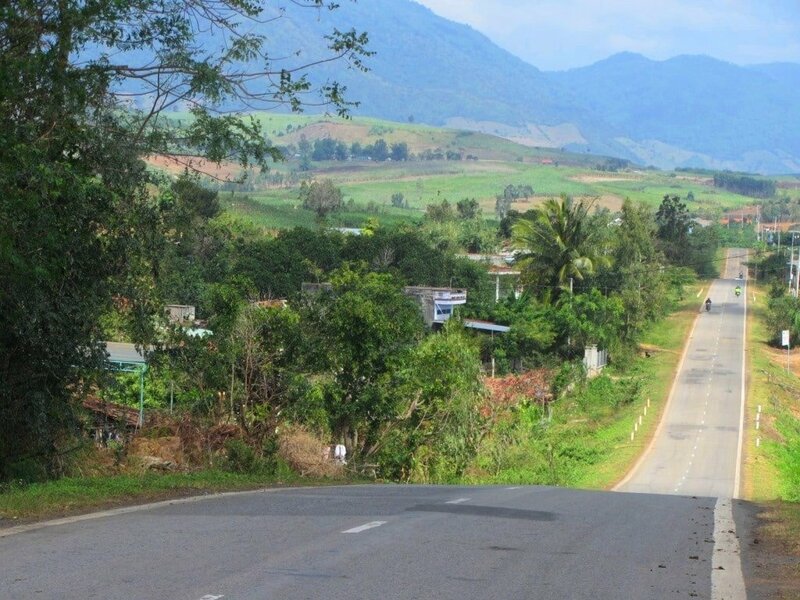 Heading South: loop back on coastal back roads to Nha Trang (see the map in my Beach Bum route), or loop back to Dalat by linking up with the Ho Chi Minh Road at Kon Tum (connecting via Road QL24). Another option is to put your bike on the train at Quang Ngai station and send it on to any of the mainline stations, north or south, along the coast. This entry was posted in ALL, Central, MOTORBIKE GUIDES, Mountains and tagged central highlands, Dalat, guide, motorbike, quang ngai, road trip, travel, truong son dong, Vietnam. Bookmark the permalink. Just to let you know we traveled from Buon Ma Thuot to Nha Trang a few weeks ago taking DT9 off QL26 and then DT12 to meet it. The area is still spectacular and well worth the time if you have it although DT12 is still very very rough going and the 100KM section took 4 hours. Then if you intend to descend the mountains you won’t reach Nha Trang before nightfall meaning QL27 is pretty scary if it is raining and the bugs are attracted to the bright headlight after feeding in the fields. I’d advise anyone wanting to have a look around DT12 to set off either way very early 6-7AM. Also people should be aware of a large amount of police patrols in Dak Lak province, we passed 4 in a short space of time 2 days in a row. Thank you for the road updates, I appreciate it. It’s a shame that the road conditions there are still deteriorating, but nice to hear the scenery is still worth it. Having been inspired by your blog (which i found after doing the Ha Giang Loop) i’ve booked flights out to Vietnam at the end of the month and was planning on riding up the truong son dong road from M’Drak to son tay (then on to hoi an). I’ve failed however to take into account that its Tet during this time and wondered what you thought it would be like if i were to attempt this route over the weekend before Tet in terms of roads and getting accommodation in M’drak, K’Bang and possibly Son Tay? It should be fine as long as it’s before Tet day (which I think is 5 Feb this year). In fact, I rode this route at that time of year once and it was fine. However, the weather could be an issue – anywhere north of Nha Trang during that time can get fairly bleak weather. Just keep an eye on the forecast – Windy is a a good app for that. thats good to know, i will have to play it by ear and see how the weather goes. Windy looks like just the app too. As always, and to echo others, your site is an AMAZING resource for travellers, Tom!. My son and I were originally planning to take the train from Saigon to Phan Theit and ride the coast up to Hue. However, having read some of your other articles, we’re now thinking we’ll head to Dalat from Phan Theit or Phan Rang then back to the coast and upwards towards Hue. I have a few questions for you around this plan. 2. Which route do you recommend from Dalat back to the coast? 3. I know the next question may be a bit harder to answer, but how long do you envision the trip to take? We’ll be on two Yamaha NVX 155s and have roughly 7-9 days to make our way from Phan Thiet to Hue. Google Maps says about 24 hours but it appears they’re not using the coast route the entire way and I have no idea what speed Google Maps uses. Guessing, our average speed will be 40 mph / 60 kph. On a related note, I recommend you offer an avenue for folks to provide a site donation given the tremendous amount of free information you provide. Something like Qgiv, Fundly, etc. I would gladly donate some cash so you could buy a sack of coffee beans, a tank of petrol, or a case of beer! I do have a Support Page here, where you can donate if you like, and I’d really appreciate it if you can. But I will have a look at your other donate suggestions as they sound very interesting. With that route, bear in mind that if you’re travelling between November and February the weather between Nha Trang and Hue can be quite wet. Whereas, most areas south of Nha Trang should be nice and dry. With 7-9 days it’s definitely a good idea to take the train from Saigon up to Phan Thiet. From Phan Thiet to Dalat and down again to the coast there are lots of options. But because you have fairly limited time, I’d suggest taking QL28B up to Dalat and then either QL20 and QL27 down to Phan Rang and linking up with the spectacular Nui Chua Coast Road (DT702) to Nha Trang, or simply taking QL27C direct from Dalat to Nha Trang. They are both good routes, but the former is more scenic because it takes the fantastic coast road, but it’s also longer. Also, be aware of the police near Mui Ne – read the first few paragraphs of this guide to find out where they are and how to avoid them. You can’t really trust Google Maps for routes or duration in Vietnam – it’s OK, but not really very accurate. In general, your average speed will be between 40-60 kilometres per hour, but that doesn’t take into account stops for photos, gas, coffee, food, bad weather, mishaps such as flat tyres etc. On another note, I’d love to know how you find the Yamaha NVX 155s, because I’m considering buying one myself. Thanks for the details, Tom. That is unfortunate news about the rain in Hue and Hoi An. I must have been looking at the wrong sites for details. Riding for hours and exploring towns in the rain do not sound like fun. Thinking now, we may have to figure out another route for our trip. Perhaps, just head south along the coast after Dalat. Does that seem like a better path? I’ll let you know our experiences with the Yamaha. Thanks for the tip on the police, too! Firstly, thank you for your donation – that’s very kind of you. It’s by no means guaranteed that the weather will deteriorate north of Nha Trang, but it is a general pattern around Nov-Feb. You can use Windy to get a pretty good idea of the forecast – just open the satellite map and click the ‘rain and thunder’ option then run through a few days zoomed in on the area you’re thinking about travelling in. I’ve found it pretty accurate. 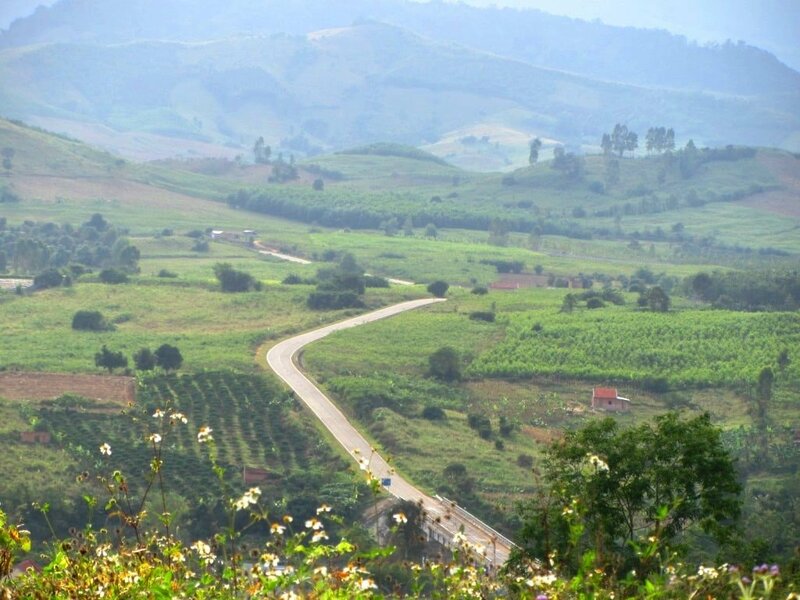 If you do decide not to push north of Dalat/Nha Trang, you can do a classic Saigon-Dalat-Coast Road loop instead. This would look something like the Tet Lunar New Year Loop. But perhaps you could work in one of the Back Roads to Dalat instead. If you take a look at those links you should be able to get an idea of what I mean. The Coast Road back from Nha Trang to Saigon is good fun – just zoom in on the relevant sections of the map in this guide and click the motorbike icons then follow the links to my guides to those specific areas. Thanks, Tom. I’ll have a look at those links. First and foremost, thank you so much. You’re the man! I’m in Kon Tum heading south on the “big one”. I need your opinion. Given the season on the central coast is not quite optimal at the moment, I was thinking about linking up with this route instead of heading to Qui Nhon. If you were me would you continue to the coast or link up with the “east of the long mountians” route. Thanks I’m advance! I just got back from a few days riding in Central Vietnam and it didn’t stop raining once. Things should be better south of Nha Trang – a great source is Windy – just choose the ‘rain/thunder’ option on the satellite: I’ve found it very useful indeed. So check that first, but perhaps a good idea would be to join the Road East of the Long Mountains until QL25 or QL26 and then head down to the coast from there. Hey Tom and readers. As far as i know after talking to locals there is a new road a few km after XA HIEU Crossroads to SON TAY that may be safer than the current route. I feel I need to mention an issue with the road about 8km north after XA HIEU Crossroads. It takes a turn off the new road into the jungle with a concrete road about 3m wide over mountain peaks with cliffs each side. Anyway on May 18th we took that route and it’s was pretty dangerous. One section of the road was gone completely and we had to make a path through rubble to cross it. The path we made was just wide enough for a bike with a sheer drop each side. This was the worst of about 7 landslides. This is about a 7km stretch that is not maintained anymore then you get back on the new road. It is very fun if you enjoy the danger but I would advise any novice drivers to steer clear. I can send photos of the road condition if you want Tom. Other that that 7km stretch the roads and great and the best I’ve ever been on. The last time I was there, there were two paths to take: one which avoided the rough section and the other which didn’t. But they obviously have a lot of trouble maintaining that section of road will all the landslides. And I think the other route to Son Tay that you’re referring to is the lower road which is also very nice. Man what an amazing road! I’m at the end of section 2 and I can’t believe this scenery! Thank you for putting this together, there’s no way I would’ve found out otherwise. Great to hear that! Well, as long as the weather is OK it gets even better from Section 3 🙂 Although, some of the road conditions might have changed since I was last there – please leave an update here if they have. It was utterly amazing Tom! The area before and after Son Tay was incredible, I had to stay for the night because it was just fascinating, I had perfect weather too. The roads are in great condition save a few patches here and there, nothing too bad (except the stretch between Ayun Pa and M’Drak but that was expected and part of the fun). I haven’t checked about the road north of Son Tay but it would be great to be able to link TSD with the Ho Chi Minh Road. 🙂 Glad you enjoyed it and thanks for the road updates – it’s good to know that the roads are still in decent condition. Yes, let me know about the road north from Son Tay, but I’m pretty you still can’t get all the way through yet. We are at Quy Nhon right now and wanted to move into the mountains tomorrow following the classic route, but can not find the description in where to sleep and what to expect. 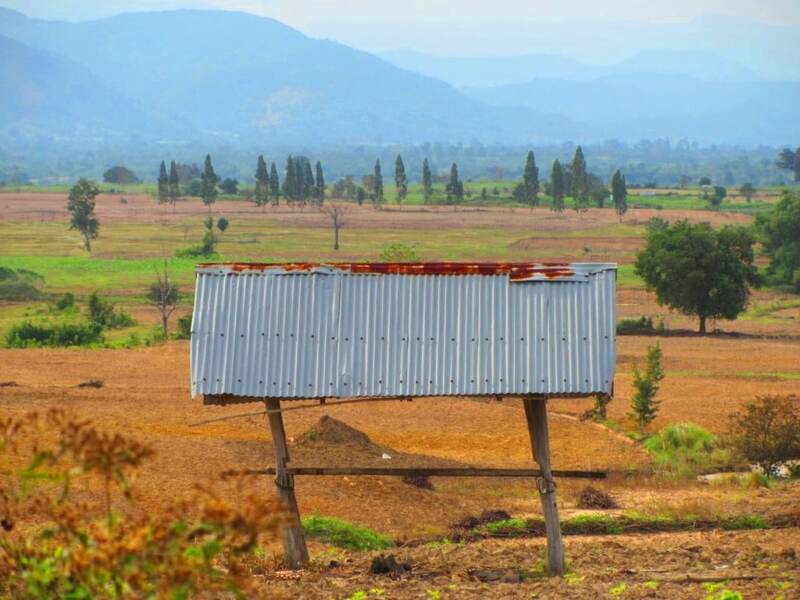 The next stop on your map is Kon Tum which is too far to reach in a day. Any ideas on how not to sleep next to a factory or highway but still do the proposed loop? What is a good stop given we will follow tu ocean road until GA duc Pho? Or should we skip this and rather do the Golden loop between Hoi An and Hue? We are unsure whether we can make it to Hue on the 9th in time and what sections we should split the mountain detour when we want to start at Ga duc Pho? Thanks for your help! 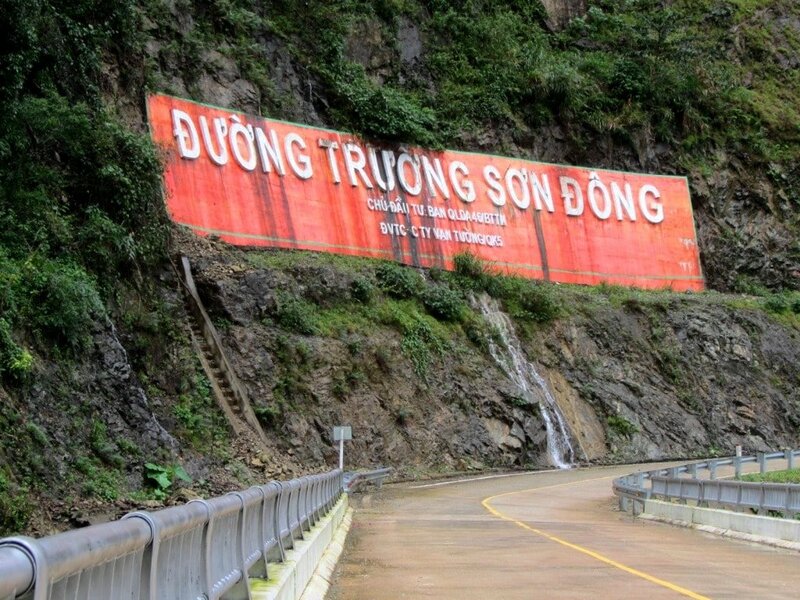 In that case, I would just head straight into the mountains from Quy Nhon on QL19 tomorrow, and then follow either the Truong Son Dong Road (on this page) or the Ho Chi Minh Road north. From Quy Nhon, you can either continue along the coast to Tam Quan (as the route in the Classic does), or you can go into the mountains direct from Quy Nhon on road QL19. Then you can either connect with the Truong Son Dong Road at the Dak Po crossroads (as described in section 4 of the guide on this page), or you can continue on QL19 up to Pleiku at meet the Ho Chi Minh Road going north to Kon Tun (as described in section 2 of my Ho Chi Minh Road guide). There is no specific guide to the section of coast road from Quy Nhon to Tam Quan, but there’s a bit more information in my Coast Road guide here. Loving the blog, unbelievably useful. Glad to hear you’re finding my site useful. I’m not sure about 19C, but QL29 was OK the last time I rode it. However, that region may have suffered landslides last November during the typhoon, but I would expect most of the damage to have been repaired by now. If you have any updates on road conditions over the next few days, please do let me know. The TSD is magic! Coming back to you re the roads. The QL 19 south from Tan An to Khu Pho was great. Good surface, locals only, small villages and smiling faces. West from Khu Pho on the QL29 also a good alternative to complete an alternative link from Tuy Hoa to section 3 of your TSD route. Just to add, the ‘desert’ section from Dalat to Cam Ranh was superb. Empty and being resurfaced as I rode it…. Great to hear you enjoyed the Truong Son Dong Road. And thanks for the tips about QL19 & 29 – sounds great. Thanks for this guide. I wanna try it in January. But do you think the weather will be bad? Are these areas at the same elevation as Pleiku and Kontum? Yes, these areas are similar elevation to Pleiku/Kon Tum, but not quite as high. I was there in January/February this year and the weather was grim, grey, wet and cold for one week and then sunny, bright and warm for the next week. So if you have more than a few days you should at least get some good weather. Hi! This map is amazing and has made me consider changing my route a bit. I am in Hoi An and heading to Kon Tum next. The next stop I really care about before Nha Trang and Da Lat is Quy Nhon. That being said, would you recommend this route or the Ho Chi Minh trail? I had planned on taking parts of your “The Big One” map but mostly staying on the trail between Hoi An and Da Lat. 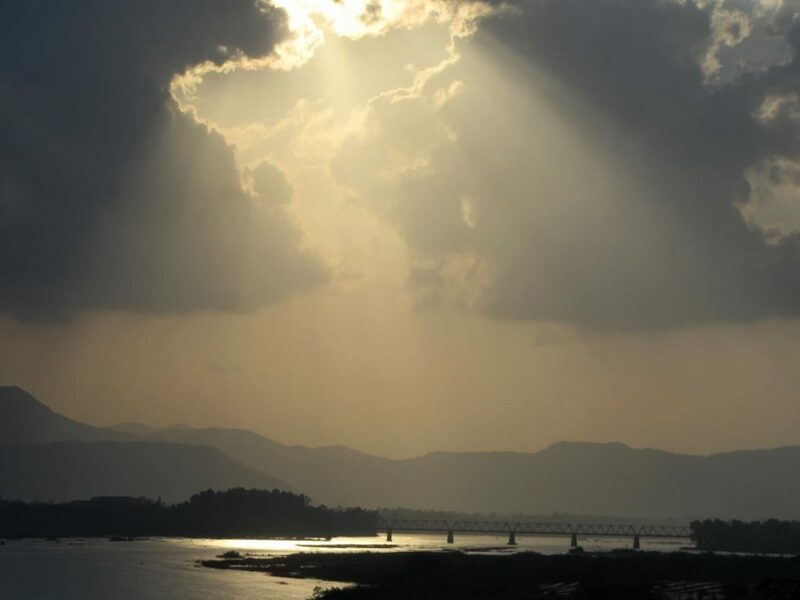 Does this route offer more scenic views after leaving Kon Tum? Or is it best to keep up with the trail? Thank you for your info!!!! I would take this route instead – it’s more scenic than the section of the Ho Chi Minh Road south of Kon Tum. Be careful on the roads, because there’s a storm passing through the region from Friday night into the weekend. Thank you! To get to Kon Tum I see this map advises to take QL24B passing through Son Tay etc. However several other travel guides mention QL24 just south as being an extremely amazing and scenic ride. I was going to take QL24 but tend to me trusting your guides more as I can see you are very knowledgeable in routes through the country. Is there a reason you chose the northern road versus QL24? Are they just as scenic? Thank you and we are all forever indebted! Actually, this guide doesn’t go to Kon Tum – it follows the Truong Son Dong Road from Dalat all the way to Quang Ngai. QL24B doesn’t go to Kon Tum: it joins up with QL24 at the Song Re River. But both roads are scenic, so it depends where you are now: if you’re in Quang Ngai city then take QL24B until it joins QL24. Or if you’re south of Quang Ngai now, just take QL24 all the way. Note that the second half of QL24 to Kon Tum was a bit bumpy the last time I rode it. Thank you for this invaluable guide to a wonderful new road here in Vietnam. I am now in M’drak and heading for Lak Lake tomorrow. All the way from Cau Le Bac down on TSD I saw signs or milestones posting distance to Yang Mao. Is it possible that TSD now runs as far south as Yang Mao? Sorry for the slow reply. To the best of my knowledge the Truong Son Dong does now yet run as far as Yang Mao, despite the mile stones. About 10km south of M’Drak the new road peters out into a dirt track, and then starts again must south of Yang Mao before coming to an end in the mountains again, as described in this guide. There are still working on the road, but it will still be some time before it is finished and finally links up for the road to Dalat. Thank you, Tom. Somehow I missed your reply to my post about the status of TSD approaching Yang Mao. Do you happen to know if the leg from Sơn Tây to Thạnh Mỹ has been completed yet? I’d imagine that would be very scenic, perhaps similar to the amazing stretch connecting Sơn Tây to K’bang. I don’t think that stretch is finished yet. But it’s worth asking locals when you get to Son Tay because that section will surely be very scenic, as you say. Thanks a lot, Tom. When I was in Sơn Tây last September the locals said TSD did not yet reach to Thạnh Mỹ. Google Maps now shows a stretch of TSD beginning just south of Thạnh Mỹ on the HCM Hwy but only going about 20km before dead-ending. I might go to TM and thereabouts next week to check things out. If I do, I’ll write a post about it. Thanks, Rick. I appreciate that. Good luck. Tom, I was just in both Thạnh Mỹ and Sơn Tây recently (i.e. around 20/2/2018). 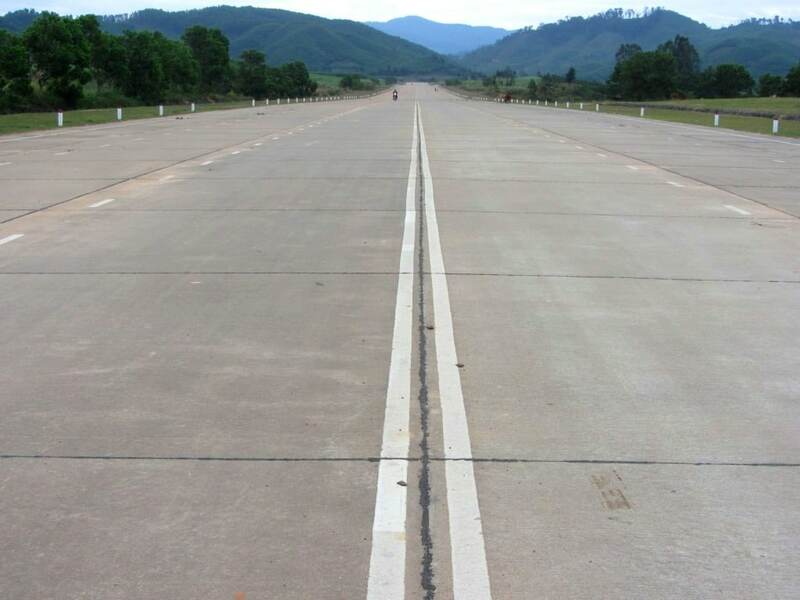 A local in Thạnh Mỹ said that the TSD stretch which will connect Thạnh Mỹ and Sơn Tây is not yet complete. A local in Sơn Tây said the same thing. She also said that eventually TSD will go through Bắc Trà My as it links Thạnh Mỹ and Sơn Tây. I’m definitely looking forward to that ride! Thanks a lot for the update on that section of road. Yes, it certainly will be a great ride when it’s complete – can’t wait to try it. Nice post! We are currently in Buon Ma Thuot and considering this route. How does it compare to taking the QL14C up the Cambodian border? I can’t seem to find any info on QL14C, so this route is sounding more appealing. Yes, I would definitely recommend taking this route – it’s great. And QL14C is not as scenic or as well made, and some riders have had problems with the police in that area, because it’s a border region. Best roadtrip I have done! 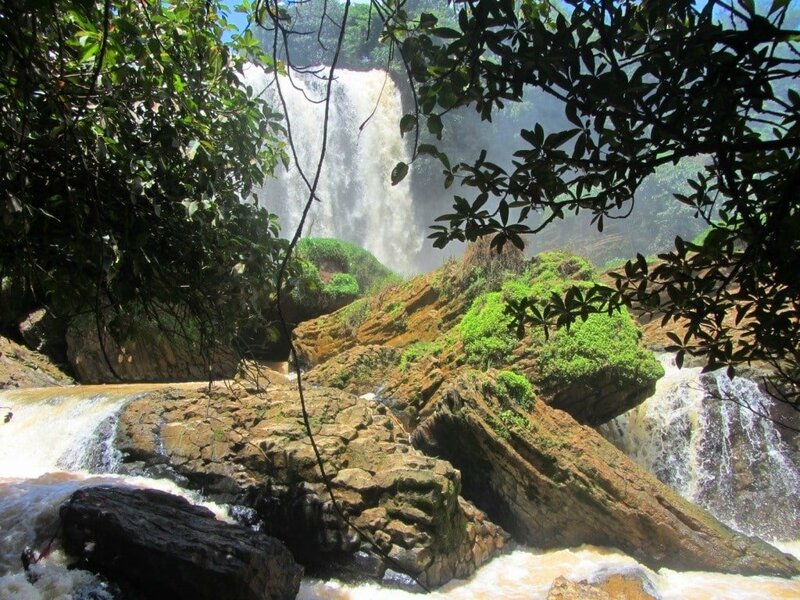 Thanks, it’s really great to hear that you enjoyed this route and the Dalat one. I will take this road on the way to the North in September. Sounds like a very interesting route. Do you still have the beloved Stavros?. I will use the Nouvo 4 for the Sep. trip. Thanks for the great infos. That’s great, I hope you enjoy your road trip. More proof why your website is the ultimate travel guide for independent travelers. As cyclists, this could open up a great route in the near future. Based on your info, I explored the Pine Tree road north of Dalat and was wondering what will happen with that road in the future. Of course, the concern with all this new road building in Vietnam is that the environment will suffer greatly. I guess is makes deforesting the countryside a little easier when you have better road access. P.S. My girlfriend and I just completed a bicycle ride between Hanoi and Ho Chi Minh and found your site extremely helpful. Thanks for seeking out all these off-beat locations and reporting on them. Thanks, I hope you get a chance to ride this route in the near future. It will eventually link up with the Pine Tree Road but it will be a long time before that section is completed (I happen to be there right now). Great to hear that you and your girlfriend have enjoyed riding around Vietnam and that some of my guides have helped you along your way. I did section 2 (option 1) today. Until Cu Dram the road was bad but the scenery was at times very nice. At Cu Dram I turned south and followed the Truong Son Dong Road for almost 15 km. This road is not just beautiful but absolutely breathtaking. I did the same thing a few days ago from the Dalat side (The Pine Tree Road is very nice but the TSD section after that is pure heaven, I think). When these two stretches are connected you get an incredibly beautiful road. After Cu Dram TL 12 becomes a nightmare (although the scenery is incredible) for about 30 km until you get to that village with the bridge. At the end, an old, exotic looking lady collects 5000 dong, well worth the thrill of crossing that bridge. At first, I thought it was the same bridge as the one in the picture in your article. However, looking back at my GoPro recording I notice it isn’t. But I didn’t cross another bridge! At least, not one that looks like the one above. So now I’m very curious where you took that photo. Anyway, this was a fabulous ride and I can’t wait for the next section tomorrow. Thanks a lot! Great to hear you enjoyed the ride. Yes, I know what you mean about the road conditions on TL12. 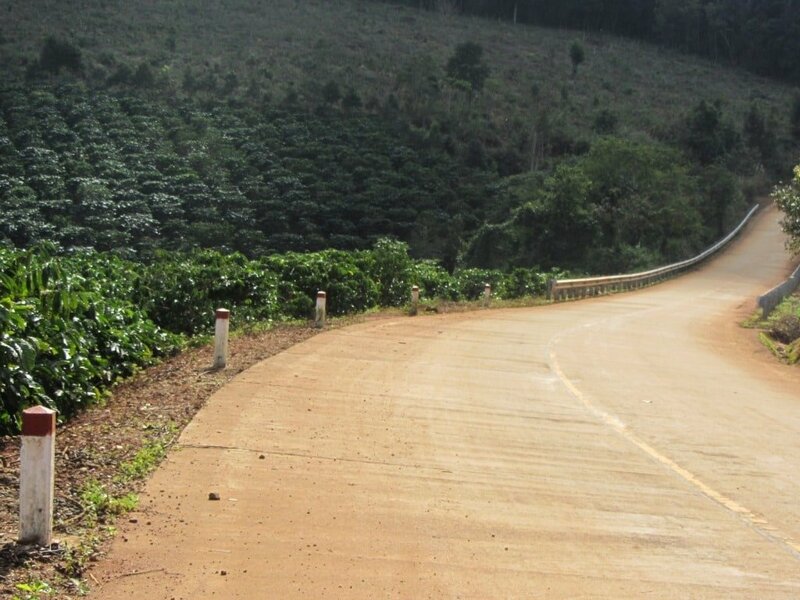 But I’m glad you checked out the short section of the Truong Son Dong Road south of Cu Dram – I agree, it will be a fabulous ride once it’s completed through to the Pine Tree Road and Dalat. I hope you enjoy the next section. WOW! You’ve done it again!!! I’m still recovering from a shattered knee and not yet ready for a multi-day ride, but you have me sorely tempted to ignore the pain and the limited movement and get back on the DRZ. This is definitely going to the top of my “once I’m healed” list. Thanks. Sorry to hear about your knee. But once it’s healed definitely give this road trip a try – it’s great for riding, and I’m sure you’d love it.